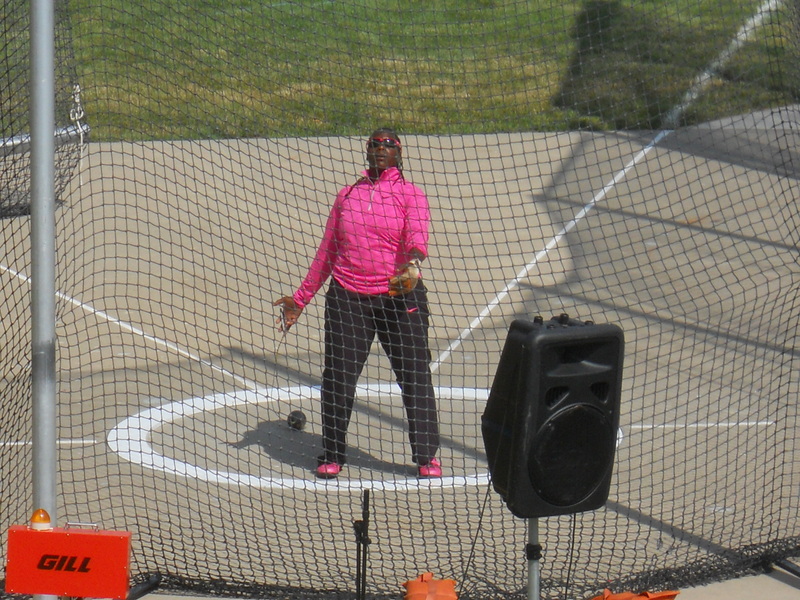 Anyone who has read my stuff and assumes that I only care about the shot and disc is in for a big surprise because I covered the heck out of the women’s hammer at this meet. One, the timing fell just right. 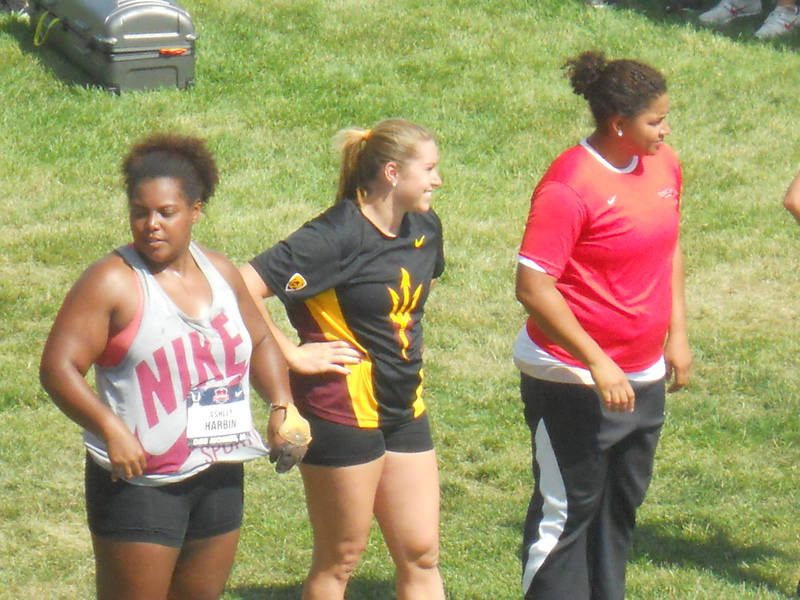 At these types of meets, the throwing events often overlap, and at Drake if one of the overlapping events is the shot put, you are forced to choose because all of the other throws take place outside the stadium. No worries on this very sunny Saturday afternoon, though, because there was plenty of time after the women’s shot to meander over to the hammer cage without missing anything. Two, I had Trofimuk–a straight up hammer aficionado–with me, and he assured me that this would be a competition well worth watching. Holy crap, was he right. …I am looking down at her from above the cage. That’s because the hammer cage is nestled into the corner of a huge athletic field that is rimmed with a grassy hill. Spectators, therefore, can flop on the grass and enjoy a sweet view of the the thrower and the landing area. Here is Art Venegas talking with Kristin Smith on that hill. Unfortunately, the layout at Drake turned out to have one design flaw. On the other side of that fence you see with all the signs on it is an alley, which leads farther down to a parking lot. Have you ever seen those giant nets that they sometimes erect at driving ranges to keep the golf balls from flying onto a road or into a subdivision? Well, the folks at Drake have placed several of those nets along the left foul line to make sure that an errant throw will not make it to that alley or parking lot. Amazingly, in spite of those precautions, the left-handed thrower Jessica Cosby Toruga launched a warm-up throw out of the cage, over the giant safety nets, and into (I think) the parking lot. I say “I think” because you can’t see exactly what’s on the other side of those nets, but it sounded like the hammer skidded across the alley and thunked against a car. Art, who coaches Cosby Toruga, must have sensed right away that something like that could very well shake a thrower’s confidence because he immediately called out, “I’ll pay for the car!” to try to lighten things up a bit. Unfortunately for Cosby Toruga, this would not be the only confidence-killing challenge she would face on this day. Once the competition began, Amanda Bingson dropped the first bomb. That, my friends, is a legit world-class throw. But Bingson wasn’t nearly finished. I was at Drake last year for the NCAA meet, which Bingson had a serious chance to win. 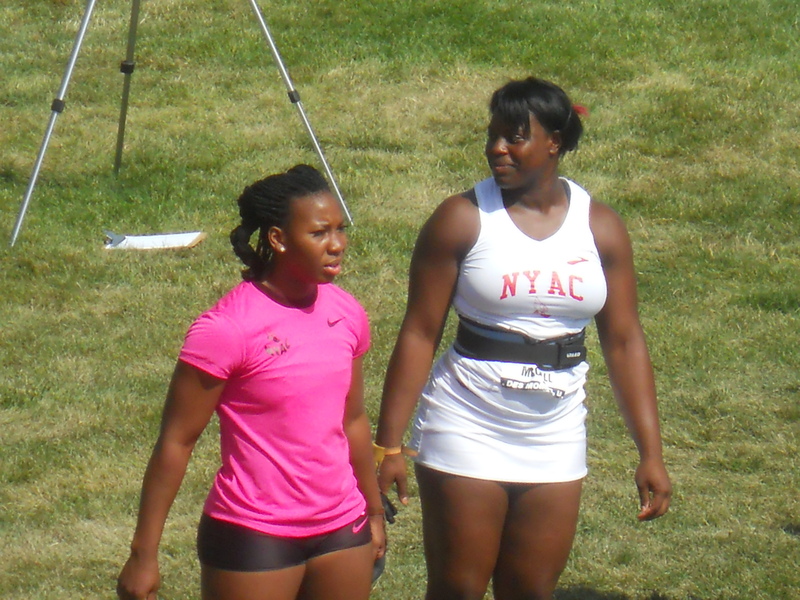 Unfortunately, she had a lousy day and finished third after fouling four of her six throws. She clearly was not haunted by those memories, though, as in round two she stepped in and set a new American record. After they announced it, she ran up the hill to show some love to Mom and Dad. One might reasonably think that all this excitement would tire a person and make it unlikely that they might shatter their freshly-set American record on their next throw. Au contraire, mon frere. 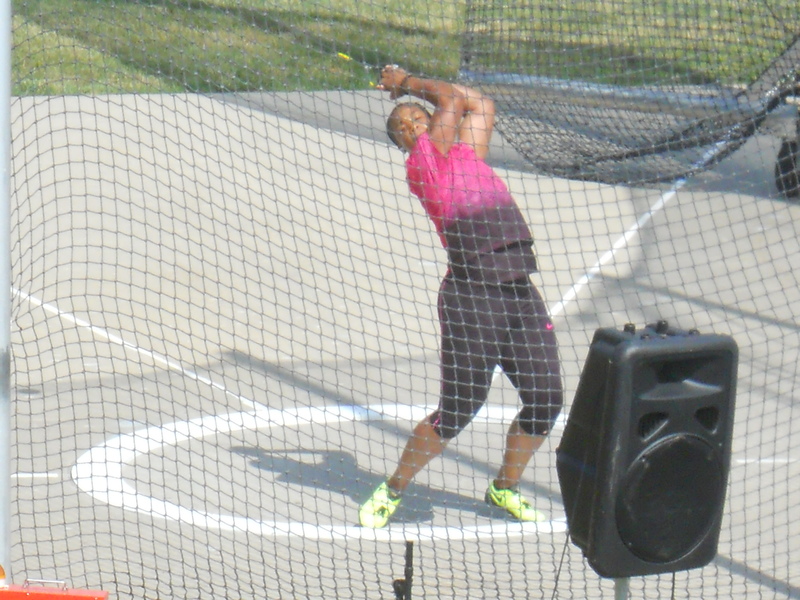 Even world class hammer throwers have their limits, though, and Bingson went 72.41m, foul, foul, in the final. She did, however, punctuate her victory with a very impressive series of back flips after her sixth throw. I had a long talk with her afterwards, which you can view in it’s entirety if you go first to Macthrow.com and then to http://www.youtube.com/watch?v=CVmrJtfuzVk as the interview is divided into two parts. 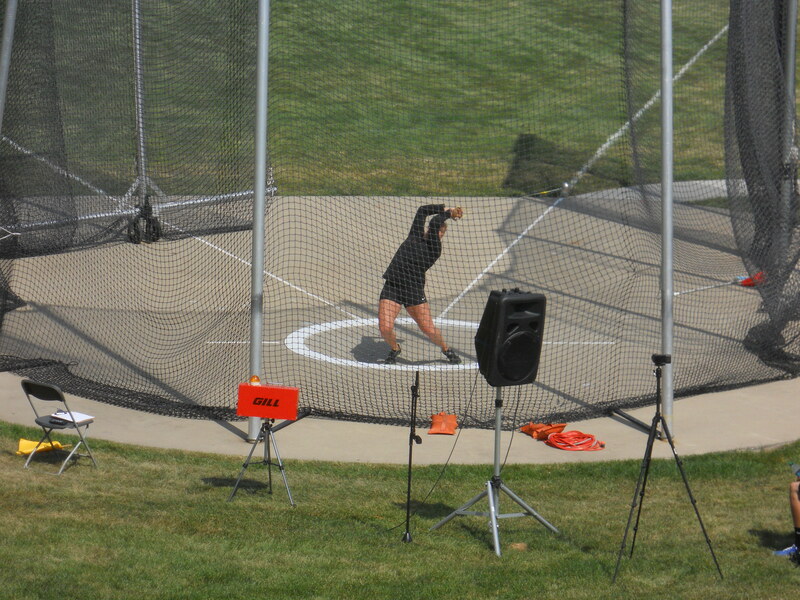 McCall, suffering from an abdominal strain that she had incurred competing in the shot, could not better her 74.00m opener in rounds two and three, and then passed all of her throws in the final. There were, however, some fine throws in the late rounds. And we’ll finish with what might have been the most remarkable throw of the day. I mentioned earlier that Jessica Cosby Toruga launched one out of the facility during warmups. It would be perfectly understandable if she had become a bit tentative after that. 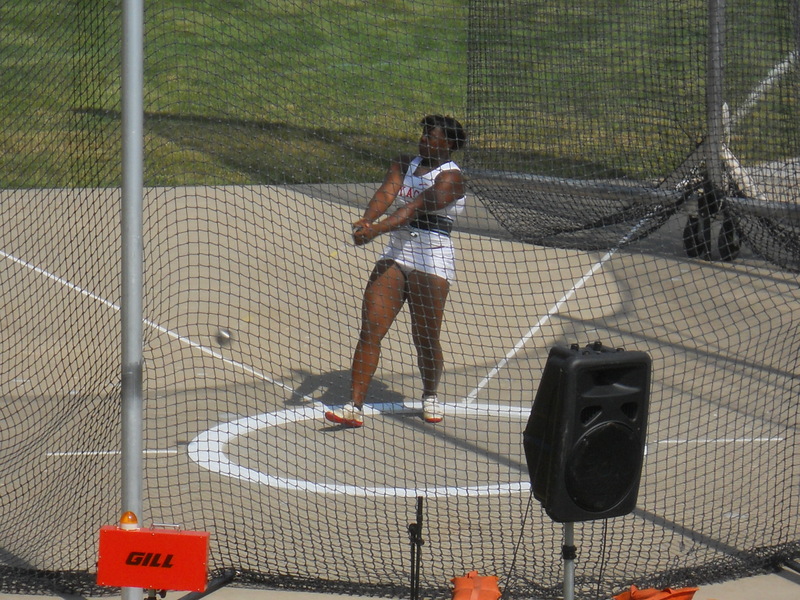 To her credit, though, she maintained her focus and nailed a round-two throw of 72.47m that had her right in the thick of things going into the final. She began the final with a fourth-round 71.09m, but on her fifth throw she lost her balance in the middle of the ring and hit the concrete hard. My first thought, when she went down, was that they had better get an ambulance over here quickly because there was no doubt she was badly injured. It was like seeing someone come crashing down on the sidewalk after jumping from a fourth floor window. Shockingly, though, after a few tense and weirdly quiet minutes Cosby Toruga got up and walked out of the cage under her own power. Even more shockingly, when her name was called in the sixth round, she was ready to take her throw. Most shocking of all,? It turned out to be her best throw of the day. It is pretty exciting that the US is sending legit medal contenders to Moscow in this event, especially considering the fact that very few kids are exposed to the hammer until they reach college. Honestly, though, I don’t see how that is ever going to change. As evidenced here at Drake, there are safety concerns with the hammer that you just don’t have with the shot and disc and it is hard to imagine high schools being willing to take on those risks. I guess we just have to hope that Fate keeps guiding the right athletes–like Bingson and McCall–to the right college programs.